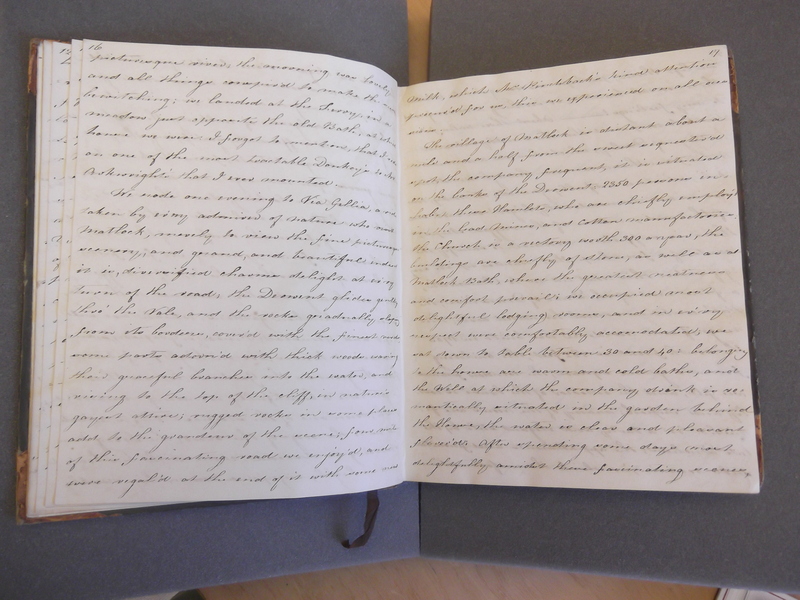 I have been looking at some early 19th century unpublished travel diaries which feature Derbyshire. Derby, Matlock and Castleton have featured heavily, as have Chatsworth, Haddon and Hardwicke Hall. What has been surprising (in the ones I have looked at) is the omission of Dovedale. Also noticeable is the absence of descriptions of the Derwent Valley Mills. It is implausible that these visitors didn’t see the mills, especially as some of them visited Willersley Castle – almost opposite Cromford Mill. It appears that while these tourists were happy to visit the urban Silk Mill and porcelain manufactuing in Derby, they were not interested in seeing industry in a more rustic setting. Their descriptions of the Derwent Valley are full of the sublime and awe-inspiring power of nature and Arkwright’s modern mills obviously didn’t fit with the search for the picturesque. ‘Smedley’s Cavern we visited, who after 17 years labour, and perseverance open’d a communication with this awful abyss, and now acts as a guide to display its beauties. This cave contains immense treasures of spas minerals and fossils, which he manufactures into very beautiful ornaments of various descriptions….. we purchased many articles for our friends, and sent them to London by the waggon’. The entrance into Matlock from the South is through a Rock, which has been blasted with gunpowder for half a mile for the purpose of opening a carriage road, on the left is a row of houses for the accommodation of Company, behind which are high barren rocks, in the front are gardens, and beyond those run the River Derwent, on this side of which is a charming shady walk formed through a wood, on the other side rises almost perpendicular stupendous rocks which are 123 yards high, 10 more than the summit of St Pauls…… at the other end of the Town is a cavern called Cumberland Cave, this is a work of art. Smedley’s of Matlock having worked at it for 17 years in order to clear a passage, it is a vast and awful place, worth exploring’.